Do you ever feel so overwhelmed with the “everydayness” of homeschool life that it is hard to see that your hopes for your children will ever be realized? When you started teaching them at home, didn’t the Lord give you hopes about what you expected to accomplish with each child? Being human, the “everydayness” of taking one step after another without a significant change of scenery can sometimes put a damper on your faith. How does one get to that “hoped for outcome” from here? Let’s recall the parable of the talents. You will find it in Matthew 25:14-30. Basically, the master gave different amounts of talents (a measure of money) to three servants—one, two, and five talents were given according to that servant’s ability. Then he went on a journey and left the servants in charge of those talents. While the master was gone, the servant who was given five talents doubled them. So did the servant who received two. But the servant who was given one talent (obviously the least amount) was afraid of losing his master’s one talent for various reasons (maybe fear, doubt, feelings of inadequacy, etc. )—so he hid his talent in the ground. The master returns and rewards the first two servants with praise for a job well done, with the promise of an increase in what the master gave them charge over, and with an invitation to enter into the joy of their lord. I have seen it happen in real homeschool life. My first example is the mother who wanted her home educated children to be musical and use that talent for the Lord. Her oldest child was 7 or 8 years old when she started taking piano lessons. A person who was knowledgeable about music told the father that the child wasn’t musical. It might have been a fact at the time, but it was not the truth. Why not? The mother had a dream. She prayed and applied her faith by continuing the piano lessons and encouraging the child to practice. This mother’s faith was realized—by the time her daughter reached college age, she was awarded a very nice music scholarship to a Christian college. She also plays the harp. Her siblings play various instruments too. I love this true story, because it didn’t happen overnight. The odds were against it happening at all. It is a real life application of being given a smaller amount and seeing the God-given increase because of faithfulness and diligence. Another example is the mother who pulled her son out of school during his sixth-grade year. He was having trouble with classes and taking Ritalin because he was diagnosed as ADD. She found out that he couldn’t write a complete sentence—let alone a paragraph, that his handwriting was illegible, and that his math skills were not up to par. The first year was spent going over the basics to fill in the gaps. Though ready to give up at times, this mother persisted and prayed. After all, she only had until high school to teach him at home. By the time he went to back to public school, his skills were improved enough that he did well. After graduation from college (remember the experts didn’t give her much hope of that when he was in sixth grade), he went on to law school where he is in his second year. Though she and her son sowed in tears, they are definitely reaping in joy! Now let’s walk the walk. 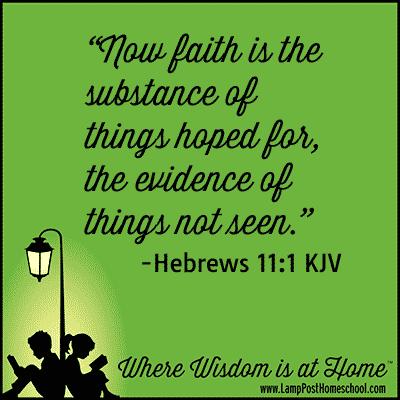 Apply faith and diligence to your homeschool experience. Identify that impossible dream, hope, or vision that God has given you for your child. Take the first step and inquire of the Lord. He will give you hope, and He will give you a target for your wonderfully unique child. Children are likened to arrows in the scripture above. Parents are the ones who “aim” those arrows by mentoring, training, and encouraging them—homeschooling at its best! Aim your “arrow” toward the mark that God has given you. Ask the Lord to send the Comforter (His Holy Spirit) to renew your strength. Ask for help and encouragement. Walk the walk of the “new man” on a daily basis. Don’t worry, don’t doubt, don’t be anxious, and don’t give up. Believe in the promises that God has given to you. Trust, believe, persevere, hold on and you will reach that mark. It works! Talk to fellow Christian homeschooling parents who have those success stories. You will be edified and built up. They will only be the age they are today for the rest of this day. Tomorrow they will be a little older and hopefully a little wiser because you are doing your job—one little step at a time.